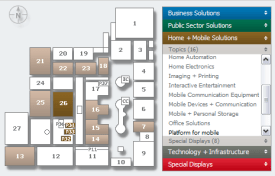 I’m not sure if you are aware but CeBIT will be taking place on the 4th – 9th of March in Hannover, Germany. The CeBIT is right after the MWC which took place just a few days ago. The difference between the MWC and CeBIT is that MWC is just about Telecoms industry and CeBIT about general consumer electronics. The CeBIT contains of 27 big halls. Today I received my Press ID from Xonio to have better access to the exhibition and to provide you with some hot stuff. Anyway, are you visiting the CeBIT? If so, what are your expectations? ~ by Norman John on February 15, 2008.
congrats, Norman, I’ll be looking forward to your coverage. I was planning on visiting, but I left it too late to try and find a hotel! Now they are all booked up! So looks like I have to wait till next year. I’ll be sure to check back for your updates from the exhibition! I’ll be there, too. On Saturday. It’s all go for you isn’t it Norman!! Have a great time, I’m really looking forward to seeing your reports. We could meet times all to nem beer on Saturday, because the day fits with us also because of work better. Yep, I downloaded one of your best and made a slideshow for the Nokia N96 if you saw. PLS answer my PM in YouTube which I sent you two or three days ago. Thank you about everything and do you know what are they going to show on that CeBit show? I’ll reply soon. I don’t know what the manufatures are going to show off. OK, I am waiting for you and your new pics 😉 !